The moment that created “cry face” was actually a pretty sad one. During an episode of Kourtney and Kim Take New York, Kim revealed that after 72 days of marriage, she was no longer in love with Kris Humphries. She told her sister about it through tears. Since that moment, Kim hasn’t seemed to mind that people were laughing at the face she made in that episode. In fact, she seemed quite emboldened by the moment and helped make the phrase ~cry face~ a thing. Kim posted this photo to Instagram with quite a cheeky caption. 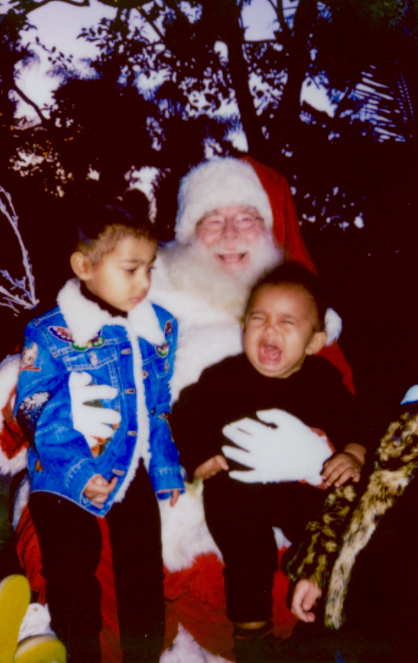 Kim has also joked that her son Saint West has inherited her cry face. Here he is visiting Santa Claus and not having it. Yeah, that’s a cry face.